The Amazon basin could suffer significant and irreversible damage if an extensive dam building programme goes ahead, scientists say. Currently, 428 hydroelectric dams are planned, with 140 already built or under construction. Researchers warn that this could affect the dynamics of the complex river system and put thousands of unique species at risk. The study is published in the journal Nature. "The world is going to lose the most diverse wetland on the planet," said lead author Prof Edgargo Latrubesse, from the University of Texas at Austin, US. The Amazon basin covers more than 6.1 million sq km, and is the largest and most complex river system on the planet. It has become a key area for hydroelectric dam construction. But this study suggests that the push for renewable energy along the Amazon's waterways could lead to profound problems. The international team of researchers who carried out the research is particularly concerned about any disruption to the natural movement of sediment in the rivers. 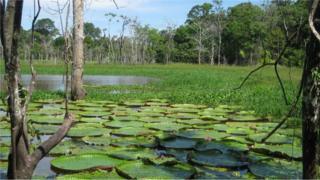 This sediment provides a vital source of nutrients for wildlife in the Amazon's wetlands. It also affects the way the waterways meander and flow. “[The sediment is] how the rivers work, how they move, how they regenerate new land, and how they keep refreshing the ecosystems," said Prof Latrubesse. The Texas researcher said that at present environmental assessments were being carried out for each dam in isolation, looking at their impact on the local area. But he argued a wider approach was needed for the Amazon. "The problem is nobody is assessing the whole package: the cascade of effects the dams produce on the whole system." The researchers have highlighted the Madeira, Maranon and Ucayali rivers - all tributaries of the Amazon River - as areas of great concern. These rivers are home to many unique species, and the scientists say these would be under threat if even a fraction of the planned dams go ahead. Prof Latrubesse said: “All of these rivers hold huge diversity, with many species that are endemic. The researchers warn that any damage could be irreversible, and they say any risks must be considered before the dams are allowed to go ahead.